While the natural prevalence of antimicrobial resistance (AMR) in traditional biowarfare agents remains relatively low, the potential for genetic manipulation, acquired or deliberate, makes the possibility of a resistant threat a necessary consideration for the biodefense posture of the United States. The Defense Threat Reduction Agency’s (DTRA) Joint Science and Technology Office (JSTO) is working to develop more effective broad-spectrum antibacterials to overcome resistance by developing innovative formulations of approved antibiotics and increasing their efficacy through improved administration methods. This approach expands the Department of Defense’s medical countermeasure portfolio and takes advantage of decreased development timelines and costs. In addition, JSTO and the Defence Science and Technology Laboratory, a component of the U.K. Ministry of Defence, in conjunction with Aradigm Corporation, are exploring the use of Pulmaquin to treat biological threats. Pulmaquin is an antibiotic formulation composed of a mixture of encapsulated liposome and unencapsulated ciprofloxacin, a widely-prescribed fluoroquinolone antibiotic. Pulmaquin is currently undergoing two Phase 3 clinical studies to determine its safety and effectiveness as an inhaled formulation for the treatment of patients with non-cystic fibrosis bronchiectasis, cystic fibrosis or non-tuberculous mycobacteria. However, Pulmaquin and an alternate formulation, Lipoquin, both demonstrated proof-of-concept efficacy in rodent models of inhalational tularemia, plague and Q-fever. 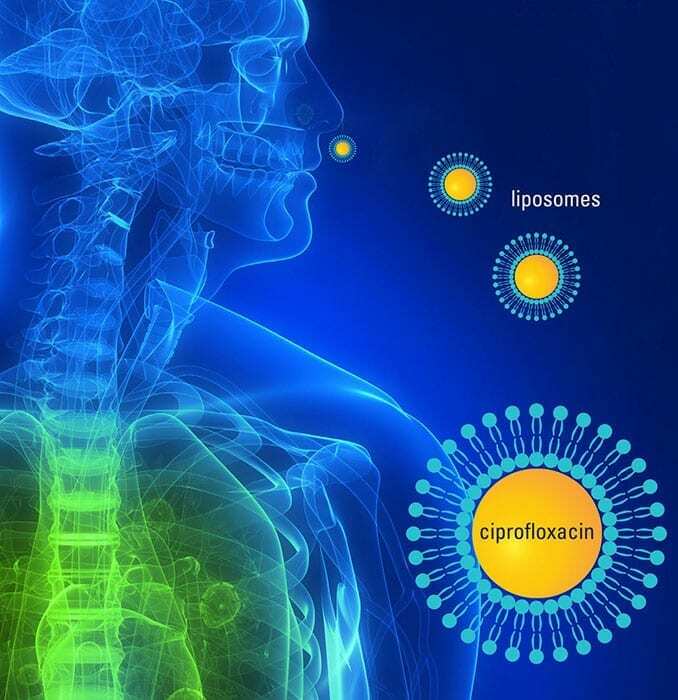 The inhaled liposomal ciprofloxacin approach delivers the antibiotic rapidly and in high concentration to the respiratory tract, the area of primary infection in an aerosol attack. The liposomal formulation retains the antibiotic over a prolonged period of time and facilitates intracellular uptake, essential to treat these life-threatening intracellular infections. In addition to offering dose sparing and a less invasive route of administration over IV-delivered ciprofloxacin, the increased concentration and residence time in the lung may overcome bacterial threats engineered to be resistant to fluoroquinolones. Article adapted from original by DTRA.